” Don’t cross the line. You know it can be costly”.A large billboard shows the image with two cars behind a line on one side and the infamous pic of Bumrah’s no-ball on the other. 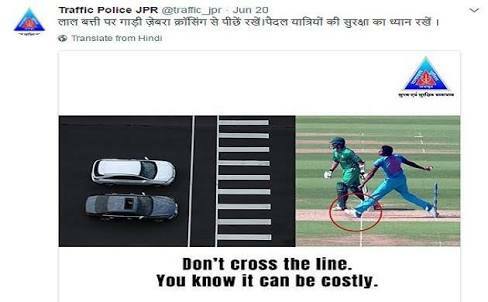 The Jaipur traffic police has used the picture of ICC Champions Trophy2017 final no-ball as a campaign for road safety. This has not gone down well with Jasprit Bumrah,has him feel bitter and left him enraged. Bumrah,who has been rested for the West Indies series,didn’t find the campaign funny and replied back on Twitter. Soon after Jaipur police tweeted that they didn’t intend to hurt his sentiments.Social media was quick to react,some supporting him,while some vent their anger for the loss in Champions Trophy.